Metropolitan growth is an important drive in urban planning and real estate development. So, in the real estate research, it can help to explain the background or the foundation of next trend in real estate market. There are five major forces conveying key information in real estate. No matter in global market or local market, competition of a market stands for its economic power and indicates its current position and future potential. Therefore, GDP is frequently referred in the beginning of general research reports. For example, in the Q3 of 2016 real GDP expanded at a 3.5% annual rate which is the strongest growth rate in two years and more than triple the rate of growth for the first half of 2016. But the flaw is that GDP is too generic to support a deep research, especially for a specific area or period. World Bank (data.worldbank.org) can provide information about GDP by countries. 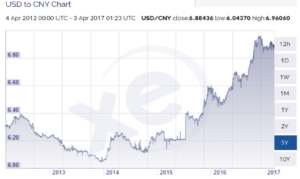 From an international scope, exchange currency rate is a significant indicator of attractions to the (overseas) investors. While its weakness is that currency would be a double-edged sword. When the dollar continues to strengthen against a basket of foreign currencies, that sword will cut the foreign investors out. On the one hand, foreign buyers increase the diversity of the potential homebuyer pool, pushing up the demand that can be very helpful in minimizing the effect of localized recessions on housing markets. But affordability and inventory can suffer – particularly in very desirable urban areas, if foreigners purchase homes in the U.S. without the intent of relocation, thereby removing these properties from the market. So, when using exchange currency rate in research, its two sides of effects must be considered. Exchange currency rate can be obtained by international finance websites or currency information website, e.g. XE (http://www.xe.com) where you can review the currency chart for selected periods. In a nationwide, CPI inflation can be seen as a consequent reaction after exchange currency rate. A strong domestic currency can decrease the inflation rate in a nation, because of lower prices for foreign products. A study of the correlation between various asset classes and inflation shows that real estate returns have the highest correlation. While in the real economy, there are a lot more factors that affect house prices and the correlation is not as prominent as in our example. So for a thorough research, these factors and their chain reaction cannot be ignored. Information about these indicators can be obtained from most major financial or research websites and US Department of Commerce, Bureau of Economic Analysis. Continued to the previous economic indicators, capital cost is also a major concern for real estate investment. The most direct indicator is the interest rate which is critical in the finance and evaluation of any investment primarily because of their impact on the present value of future cash flows and current mortgage. When the interest rates go up, the monthly payment increases and the value of any future cash flow decreases, which in turn lowers the value of the asset. However, interest rates never change alone, so it is useless to analyze the potential effects on real estate value without thinking about the other factors that may occur in tandem with changing rates. Interest Rates are various from lenders, where we may get information directly. But the most common one is the Federal Funds Rate which can be obtained from Federal Reserve. There are also some prime rates can be reliable references, such as WSJ Prime Rate or LIBOR. Another indirect indicator – 10-year treasury yield is also drawing attention from investors and researchers. And treasury yields are related directly to mortgage interest rates, which affect home buying and refinancing decisions. Usually, treasury bonds are benchmarks for mortgage and other loan rates because they are risk-free assets. There is a strong correlation between mortgage interest rates and Treasury yields, according to a plot of 30-year conventional mortgages and 10-year Treasury yields using Federal Reserve Economic Data. 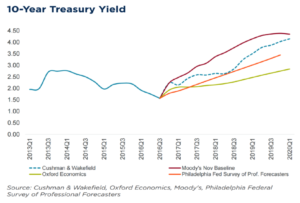 The other reason 10-year treasury yield became an economic indicator in real estate is because many investors have been laser-focused on how a rise in US Treasury rates could trigger a rise in cap rates, and therefore a fall in real estate values. Upon Morgan Stanley’s technical analysis, the correlation between cap rates and Treasury rates turns out to be tenuous. This suggests that other key variables may influence cap rate movements and real estate which need a deep exploration. For 10-year treasury yield, most finance websites (e.g. yahoo, Cushman & Wakefield, Oxford Economics, Moody’s) can offer accurate information. From the perspective of market volume, investment sales can indicate the dynamic in the real estate market which including office, retail, industrial, multifamily, hotel and lands. While the peak year of sales activity in this cycle was 2015 (at $546.3 billion), it never surpassed the previous peak year of 2007 ($569.9 billion). This was a function of many factors, including pre-election jitters along with a sharp move upwards in Treasury yields which had many investors pausing and recalibrating. Key players are also a part of this indicator. 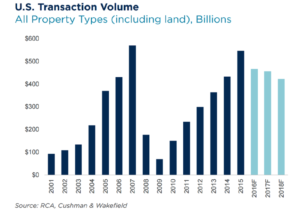 Like the largest players in the market—private equity and institutional investors—grew their investments in commercial real estate modestly in 2016. These two types of buyers accounted for more than 70% of asset purchases. So this indicator can help researcher or investors forecast the next quarter or year, also track the major player in the market. But for any specific type of real estate or area, the total investment sales cannot help with identifying the internal changes and future trends. While the total volume of investments sales can be obtained from RCA, NCREIF, Moody’s Analytics and other major real estate or finance consulting websites. To solve the problem of internal changes, it is necessary to track related industries to see how it influence real estate market. And it also shows the economic structure which could be healthy or unhealthy, traditional or innovative. The first industry indicator could be technology. Silicon Valley is a typical example which can refer to all high-tech businesses in the region. The term is now generally used as a synecdoche for the American high-technology economic sector and became a global synonym for leading high-tech research and enterprises. In real estate, it is also like a landmark which developed and boomed with technologies. So this area has an innovation and advanced economic structure, and it would definitely attract investors or developers to create spaces for them to live, work and shop. 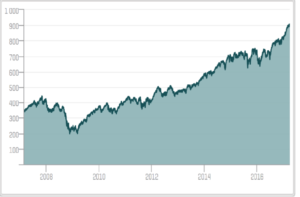 There are some major indexes can be indicators for the technology industry, like the S&P 500 Information Technology Index, which comprises those companies included in the S&P 500 that are classified as members of the GICS information technology sector. The tendency is remaining positive, but this indicator is too generic like GDP, only shows a simple impression. For a specific research, there would need a more statistics analysis for technologies companies. S&P 500 or NASDAQ can offer industry indexes which are more reliable and updated. With the rapid growth of Information Technology, there is another topic – E-Commerce which is often brought up to compare with traditional retail. 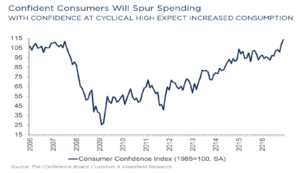 For the whole retail industry, consumer spending growth is an important indicator for researcher and investors to evaluate the whole market performance. In 2016, retail closures and bankruptcies were up significantly, and over 4,000 major chain closures were tracked, a figure that surpassed 2010’s record 3,600 shuttered major chain storefronts. In addition, there were 26 major U.S. retailer bankruptcies during 2016 compared to 22 in both 2015 and 2014. Therefore, a few major retail categories will be contracted, while other sectors that have been growing will increasingly face issues of market saturation that will slow expansion. Contraction from department store chains and high-profile apparel in 2017 will mostly impact mall and lifestyle center properties. However, the anticipated atmosphere of uncertainty may negatively impact publicly traded brands beyond those categories. On the whole, neighborhood/community and power centers will perform best with the least exposure to contraction, while the impact of these trends on mall and lifestyle centers will be disproportionately felt by Class B and C properties, particularly those in secondary or tertiary markets. Although this information is not direct with the retail tenants or landlords, it can impact investors’ decision and the retail real estate market from its rent, absorption and vacancy. In this case, retail sales should be an indicator to reflect the changes in traditional retail market. However, with a larger share of that spending going to eCommerce. This indicator only can reflect consumers’ buying power, but cannot be analyzed for traditional retail or e-commerce. Cushman & Wakefield and similar real estate service companies offer detailed reports for retails and shopping centers by locations. Like mentioned before, a large share of retail sale is going to eCommerce. With that said, the demand of warehouses and distribution centers will increase, then industrial real estate will continue to benefit from this growth. So the eCommerce sales can be another industry indicator. But due to its limitations, it may only apply to specific research in industrial real estate. E-commerce sales information can be obtained from US Department of Commerce. There is another commonly used industry indicator for research in industrial real estate — ISM Manufacturing Index. The ISM manufacturing index is based on surveys of 400 purchasing managers nationwide regarding manufacturing in 20 industries. The index has a strong correlation with manufacturing industrial production and provides timely information on manufacturing. The ISM index is also a good leading indicator of the economy and is useful in gauging turning points in the business cycle. However, ISM index does not capture technological change and production efficiencies, which make it possible for production to expand while employment contracts. 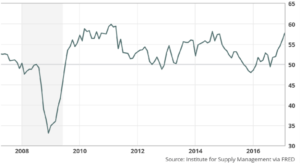 ISM Index, as a common index industrial business, can be obtained from Institute for Supply Management directly or related industrial reports. Demographic are the data that describes the composition of a population, such as age, race, gender, wage, migration patterns and population growth. These statistics are an often overlooked but significant factor that affects how real estate is priced, what types of properties and the major age group are in demand. Major shifts in the demographics of a nation can have a large impact on real estate trends for several decades like baby boomers and “two-child” policy. Increased population requires more housing, shopping, working (which includes both factories and office buildings) and more hotels for recreation. However, the number of the population growth cannot explain the inside population structure. So following the previous industry indicators, besides indicators like age, race or gender, demographic indicators would include the total employments and employments in different industries in this case. The first common index is non-farm employment which represents employments working the secondary and tertiary industries who would take up most commercial real estate in the market. But it is not detailed enough to support further research. So, the office-using employment would be an important indicator for office while industrial employment would indicate the quantity of labor in industrial real estate. These specific industry employments can indicate the expansion or contraction of the industry, then indicate its demand/supply in real estate. While the income in any specific areas can translate into consumers’ confidence index which indicate consumers’ buying power and the affordability of housing. Overall, demography is a critical driver of real estate demand with the population growth, including immigrants. In 2015, in 44 million immigrants living in the United States. At the current pace, the foreign-born population will grow to 52 million by 2025—more than one of every seven residents. But most immigrants have their preferences in locations, so the significance of this indicator may work for a few cities which attract immigrants rather than the whole country. Demographic data can be obtained by U.S. Bureau of Labor Statistics. Besides the population growth, there are some factors impact real estate demand, such as relocation. One of the most common reason is retirement. The traditional labor pool of the working-age population 20–64 will grow much more slowly over the next decade, which means slower job growth and rising wages. From ULI data, the retirement surge over the next decade means that by 2025, the number of people leaving the labor pool (the total number of people ages 20–64) will almost equal the number entering it. ULI also predicts Household growth over the next decade will tilt heavily south, toward the “affordable sunshine states” of the Sun Belt: Florida, Texas, the Southeast, and the Southwest. So the retirement indicators are significant in relocation and senior housing/Health Care research. Returning suburban growth is one of the relocation trends. Urban areas, which tend to have less room to build, higher prices, and fewer desirable schools, will capture 15 percent of household growth, modestly boosting cities’ share of the total number of households. 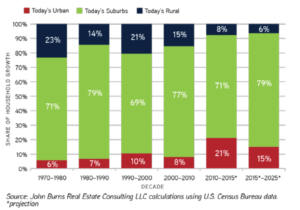 Many suburban cities created decades ago that are now largely built out continue to reinvigorate themselves with vibrant suburban downtowns composed of new retail and residential developments. 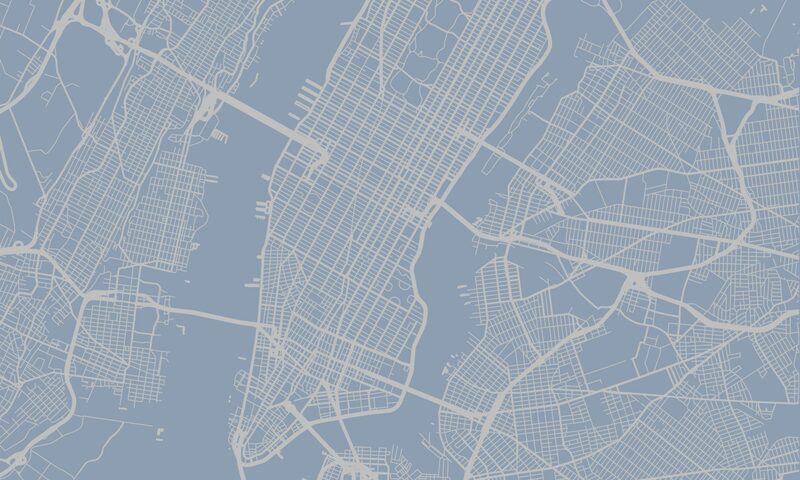 In suburban areas, home size, privacy, housing affordability, and kid-friendliness feel more urban than suburban, while school quality, public transportation, and proximity to employment feel more suburban. Because both cities and consumers want retail that is walkable from housing, retail and residential developers should work closely to create cohesive developments to satisfy this evolving consumer. An 86 percent surge in household formations to 12.5 million households over the coming decade in comparison with the prior decade will drive purchases in all stores that cater to new households, particularly renters, who will constitute 58 percent of the net new number of households. Another relocation trend is the shift to sharing and experience economy. The new sharing economy, which includes more opportunities to rent or borrow than ever before, will most certainly affect household formation and spending patterns. The well-known examples are Airbnb and WeWork, which hit the hotel market and traditional office market representatively. While these trends are still in the process, so it might be difficult to track timely in research. Information for these relocations can be obtained in Urban Land Institute.